A free online archive bioRxiv was set out in 2013 to shake up the culture of the life sciences. By posting preprints on bioRxiv, authors are able to make their findings immediately available to the scientific community and receive feedback on draft manuscripts before they are submitted to journals. BioRxiv – a free online archive and distribution service for unpublished preprints in the life sciences – was launched in 2013 to be biologists' version of arXiv, - a highly-automated electronic archive and distribution server for research articles in physics, which bioRxiv is intended to complement. BioRxiv is operated by a not-for-profit research and educational institution Cold Spring Harbor Laboratory (CSHL) in New York state. The goal of bioRxiv is to advance the sharing of research results for the life sciences, thus giving scientists a way to get feedback on their papers before they are formally peer-reviewed. Before submitting to bioRxiv (in draft or final form, unpublished at the time of submission) for free, authors should consult lists of journal policies on Wikipedia and SHERPA/RoMEO. Authors should also abide by all relevant community guidelines for use and acknowledgment of data resources (e.g., the Fort Lauderdale guidelines), obtaining permission where required and citing the appropriate laboratory, website, and accession numbers. “For scientists who might worry that posting a preprint will jeopardize its chances at a journal..: one-fourth of bioRxiv’s papers have later appeared in scores of journals, including the most selective… if you look at the quality of the journals, 95 journals now have papers that were up as preprints.” (sciencemag.org) . 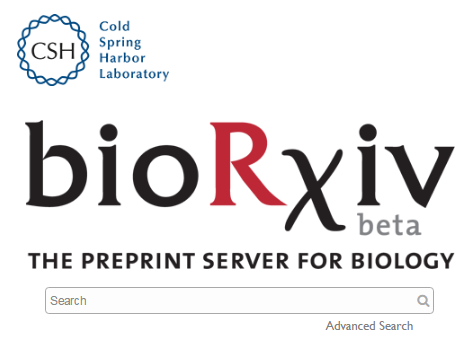 On 15 January, 2016, CSHL “announced that authors of manuscripts posted on its preprint server bioRxiv can now submit their papers directly to several leading research journals, avoiding the need for reloading files and re-entering information at the journal’s website. The first journals to participate in this initiative are Biophysical Journal, eLife, The EMBO Journal, EMBO Molecular Medicine, EMBO Reports, G3:Genes/Genomes/Genetics, Genetics, Genome Research, and Molecular Systems Biology. Direct submission to Proceedings of the National Academy of Sciences of the United States of America will also soon be available". (CSHL news). (3) Contradictory Results (articles with results contradicting and/or do not supporting largely replicated experimental approaches). Articles in the physical sciences, mathematics, or social sciences should only be posted on bioRxiv if they have direct relevance to the life sciences. Articles on bioRxiv are not peer-reviewed, edited, or typeset before being posted online as PDF files. However, to assure that articles uploaded to bioRxiv reflect real life sciences, all of them undergo a basic screening process for non-scientific content. BioRxiv doesn’t accept clinical trials or other research that is medically relevant. However, human genetic data could be posted. After an article is deposited in bioRxiv, it is citable (with reference to a DOI) and therefore cannot be removed. Once an article is published in a journal, bioRxiv will automatically update the preprint with a link to the published version. The copyright remains with the author, who is asked to select from several distribution/reuse options under which to make the article available (CC-BY, CC-BY-NC, CC-BY-ND, CC-BY-NC-ND, or no reuse). By posting on bioRxiv, authors explicitly consent to text mining of their work (e.g., by search engines or researchers). Articles published on the bioRxiv are retrievable via the web interface at no charge. Readers may add public comments to these articles and are also free to contact authors directly. If you have any questions related to bioRxiv, please Contact BIORXIV directly.